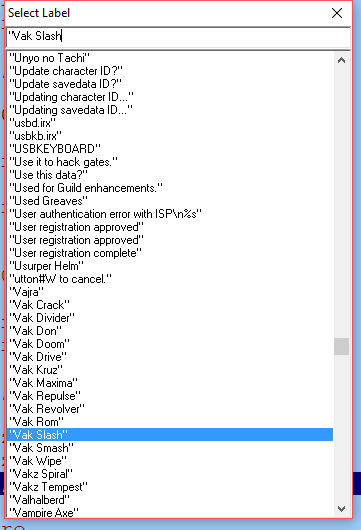 Double click on “Vak Slash” and you will be brought to the place in the file where it exists. As you can see, there isn’t much room after the “h” to really add anything more to this string. So what we need to do now is find the pointer that checks this address “0060a940” and loads this string. Click ok and you will be brought to the address “004cac80”. This is the pointer. If you press W while on this line and then enter twice you will see that it shows “Vak Slash”. Take note of the data of this address since we will need this later when we go to hex edit our changes in. The pattern is 40a96000. Take note of the pointer address “004cac80” because we will need to come back here later. So now we need to find an area in this file that is empty. The best way to do this is to Press Control F again and enter a bunch of zeros. So something like 000000000000000000000000000000000000000000000000000000000000000000000000 should be just fine. Once you press enter you should end up at the address “004cfca0”. If you look a few addresses below it you will see that there is a decent amount of space to work with so this is where we will be adding in our new text. Take note however of the data in address “004cfc9c” because this will be important when it comes to hex editing this file later. I will give you the hex pattern here so you won’t have to worry about it later. The pattern is b0437000. All we care about is the data however what we do not need is the data 20202020. Again this is part of the code that this was originally generating and does not apply to what we are doing. So you can skip the first line and move onto the second. You will notice that it still says “Vak Slash”. However on the far right it will actually show what it’s pointing to. The reason it say’s “Vak Slash” Still is because when we hit enter on it twice it just created a label. You can remove it by hitting enter on it and deleting the text in the label but it’s really not that important. So as far as this is concerned we are done with our setup and we can now start writing this data to the file. 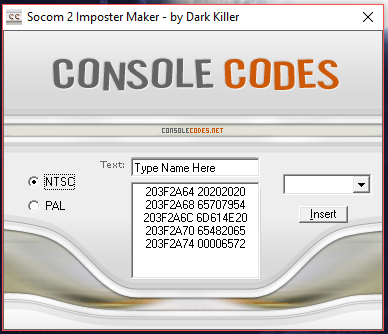 Do not close PS2Dis since we will be needing this still to know what data to add into the HACK_00.ELF file. Open HxD and drag the HACK_00.ELF into it. The first thing you may notice is that the addresses on PS2Dis and HxD don’t quite match up. That’s fine, its not important. Now we want to write our changes and the first place to start is with the pointer. In HxD press Control F and enter the the hex pattern 40a96000 and select Hex-Values for DataType. You will be taken to the place in the file where this exists and this would be our pointer. We need to change the 4 bytes to our new address. In PS2Dis on the make sure the pointer line is highlighted and in the grey textbox take the 4 bytes A4 FC 4C 00 and replace 40 A9 60 00 in HxD. When you make a change it will be marked in red in HxD. Now we want to edit in our new text into HACK_00.ELF. 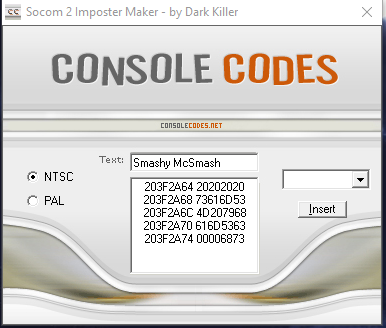 In PS2dis make sure your pointer address is selected and press spacebar. The line will now change from the dark blue to a grey. Press the right arrow key on your keyboard and it will take you to your new text that you entered in prior. 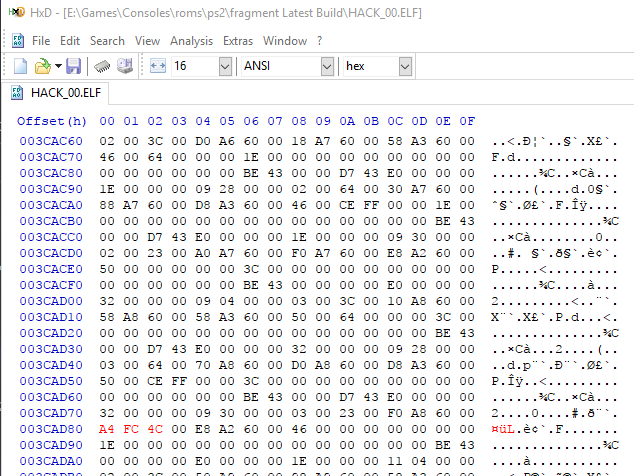 Now since this area in the original file is nothing but zeros doing a Hex Value search for this would be a pain. Once this is done you can save you changes in HxD. Now if you make an ISO of your game and copy the edited HACK_00.ELF you made and launch the game (granted you have the same spell) you will see your change in game.